This week’s Animalz post goes deep on timing. When you’re trying to grow a blog, the topics you cover are either trending up or down. 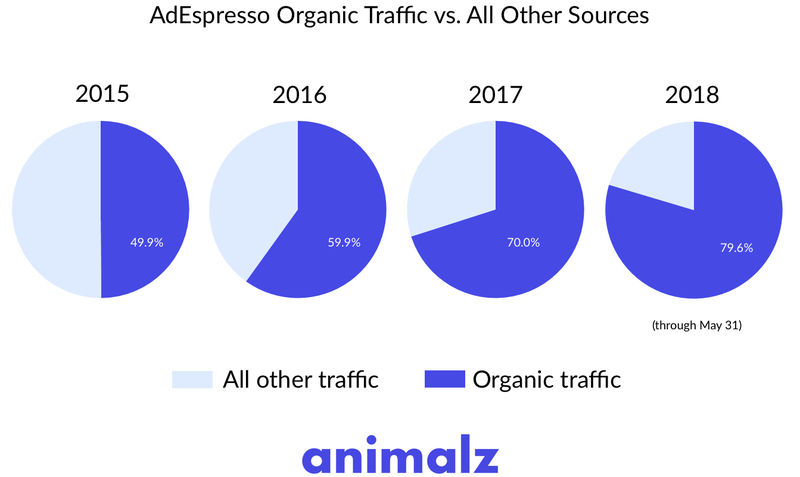 First, we look at how AdEspresso rode a massive wave of growth, then explain how we’re trying to do the opposite at Animalz. AdEspresso allowed us to share some metrics from their Google Analytics— they are 🔥🔥🔥—and a bunch of other content marketers started sharing some stats of their own on Twitter. I’m way late to this story, but was really inspired by Joe Rogan’s podcasts with Jesse Itzler and David Goggins. A few years ago, Jesse (entrepreneur and husband to Spanx founder Sarah Blakely) asked David (a bad@ss Navy SEAL and ultramarathoner) to live with him for a month. Hilarity and a few important life lessons ensue. This is a long read, but a powerful one. I highly recommend it. I won’t say exactly which words I’ve muted, but I can say that Twitter is much more pleasant after doing so. You can now listen to Bob Ross on Calm (the meditation app). Peep Laja is hiring a content lead at ConversionXL.